I mention this because even after the headline to this article, you might not realize it. And who could blame you, what with all the kneeling before Khonshu and such. Nonetheless, it is true. And, I assert, Spector’s Judaism is the “birth” of his multiple identities. Moon Knight’s Judaism does not tend to get brought up all that often in MOON KNIGHT comics. 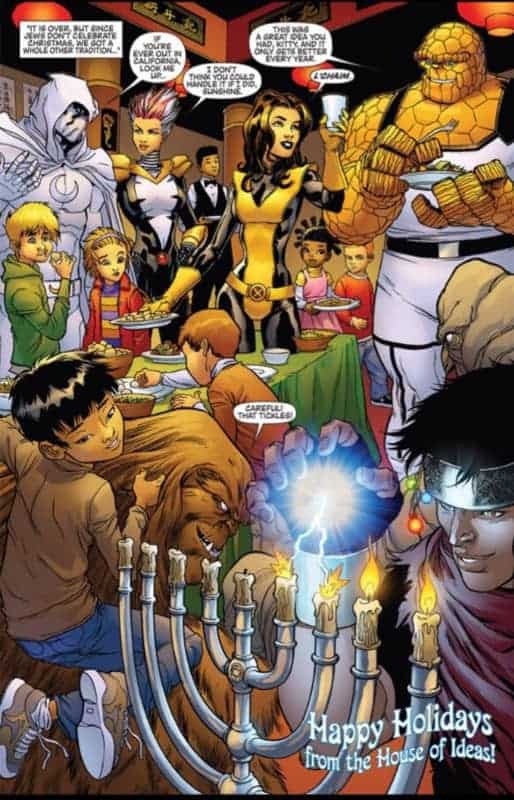 There is the occasional image in a holiday special (see above), but otherwise you would be hard-pressed to find textual examples. The creators of Moon Knight — by which I mean Doug Moench and Don Perlin, not The Creator — were unaware of Marc’s Judaism when they first presented him on the page. 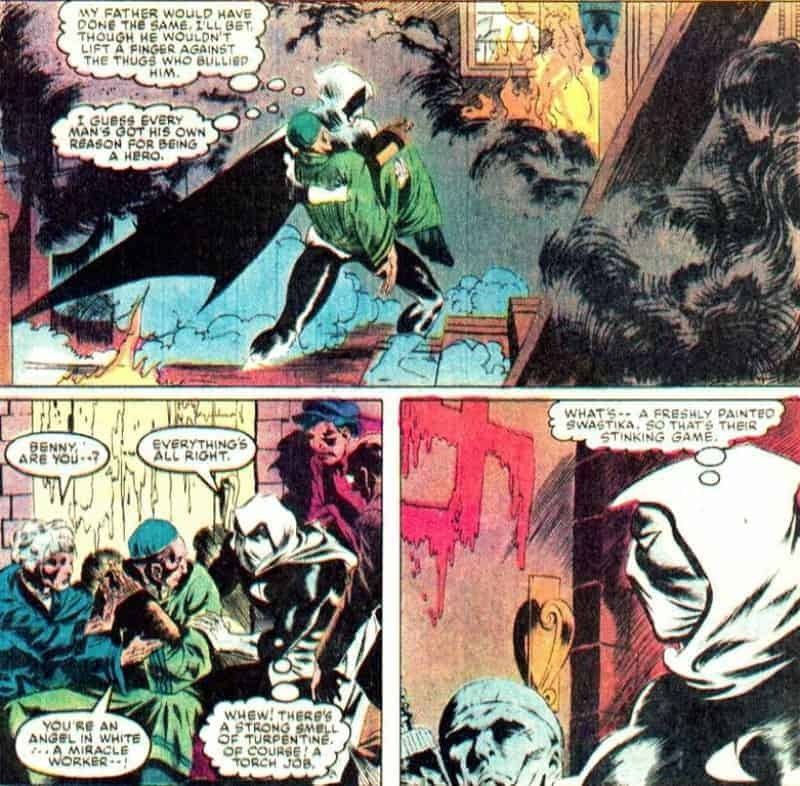 In fact, it would be 9 years before Spector’s religious affiliation ever received specific mention in MOON KNIGHT #37. By that time, Moench had been off the book for four issues. It had been years since Perlin drew the character. Instead, writer Alan Zelenetz and artist Bo Hampton delivered this moment of revelation. The series lasted one more issue after. 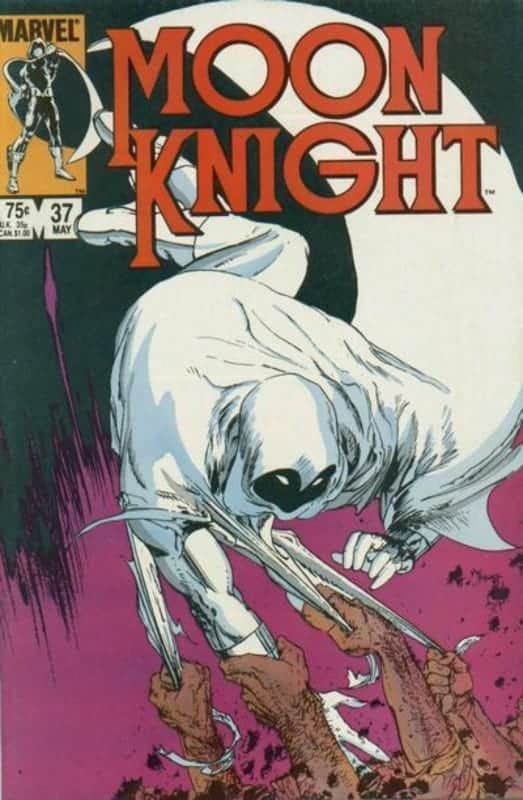 Zelentz would go on to write the first four issues of MOON KNIGHT vol. 2 a year later. 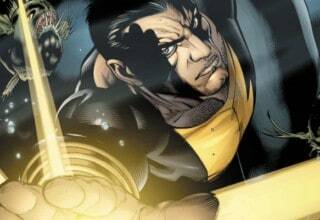 Hampton would never draw the Fist of Khonshu after MOON KNIGHT #38. In a story called “Red Sins,” Moon Knight traveled to Chicago to investigate what happened to his father. During the investigation, we saw Spector did not just grow up in an observant household but that his father was a rabbi. In other words, Moon Knight may have been Jewish, but for nine years no one knew it. In the same storyline, we learn that while Marc may have lived under the same roof as a rabbi, he did not come to his faith with ease. At some point in his adolescence, he lost the faith, if he ever had it in the first place. As a result, Spector likely lived a publicly faithful life while being, essentially, only culturally Jewish. Except Marc Spector never did. He never transitioned away from this unhealthy form of coping with internal strife. Instead, he got really good at using it. Given that, I assert — with all due respect to colleagues and writers like Max Bemis and Brian Michael Bendis — that Marc Spector, in fact, does not have Dissociative Identity Disorder (DID). This first need to switch between identities is a defining moment. It is the start of Spector learning to be one person in one situation and another in another. Do not, however, take this as evidence of him being a bad person or inherently deceptive. This not the case. Marc found a maladaptive means of coping that worked in the short-term. Over time, though, it became crutch. Rather than confront the moments in his life where he felt divided between expectation and reality and find a synthesis, he continued to respond by creating increasingly more elaborate identities for himself. In training, I often mention the child of an alcoholic dad. This child learns to run away from home when dad drinks because the drinking leads to dad hitting. Dad cannot hit someone who isn’t there, though. This is an effective coping mechanism. However, as an adult, it becomes ineffective and unhelpful to run every time that former child of an alcoholic feels stressed or threatened. What once was their best coping mechanism becomes their worst. This is the case for Moon Knight. Except instead of just becoming inappropriate, this coping strategy gave rise to a Delusional Disorder wherein he would struggle to discern who he really was. He became so bad at the unhealthy coping strategy he, in essence, created a shattered reality where he had no true self. In the Jewish faith, there is a lineage of practitioners referred to as Kohen. Kohen are descended from those who served as priests in The Temple. As a result, they cannot be amongst dead people except under a very specific set of circumstances, such as the death of one’s spouse. They do not include raiding ancient burial places with an eye towards stealing objects of great wealth and/or historical significance. However, this is exactly what Spector did for a time after leaving the United States. If Spector does not descend from Kohen lineage, then this would just be good ol’ fashioned grave robbing. Frowned upon, for sure, but not specifically forbidden to the same extent. While, near as I found, he has never been specifically singled out as Kohen, there is some textual suggestion that he might be. The most significant of these comes from Spector being part of a family that has gone into serving the faith for generations. That is, for generations before Spector. 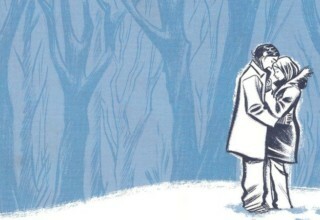 This is not definitive, of course, but in the realm of comics, nothing really is. Still, if we choose to consider this subtext, it reveals another moment that Spector’s faith and traditions were at odds with his personality and ambitions. In light of this, in order to rationalize his actions, cognitive dissonance would raise its head. In reaction, he would need to again suppress his cultural ties and knowledge once more. Thus, another split. Eventually, being a mercenary raiding the artifacts of an important ancient culture for personal gain caused trouble for Spector. Who could have guessed, right? Beaten badly and left for dead in the rapidly cooling night desert, the man who would be Moon Knight finds salvation in the very people whose ancestor’s tombs he had just ransacked. These Egyptians carried him to a shrine to Khonshu where the mercenary briefly died on the altar. The god appears to Spector in a place between life and death and offers him an prospect: live again as my avatar on Earth or die, your soul heavy with sin. Ever the opportunist, Spector agrees. Thus, he experiences another split along the fault line of his Judaism. He is now the son of a rabbi literally presenting himself in supplication to a god of the people who abused and enslaved his ancestors. He has, in a way, betrayed the faith of his father to extend his own life by swearing fealty to another faith he does not fully believe in. One interesting note is that, in addition to being the God of the moon, Khonshu is the God of travelers. This presents an interesting connection to the Jewish people’s characterization as wanderers due to their formative history — 40 years lost in the desert — and the need to consistently run to escape persecution. Traveler isn’t a perfect synonym for wanderer but it certainly is on the same block linguistically. Thus, it does not strike me as far afield to suggest there is an imperfect but nonetheless compelling link here. Surprisingly, as far as I could find, this connection has never been raised or explored. I think it would be a fascinating element to illuminate and investigate. Not the least because it could disrupt the cycle that Spector has found himself trapped in. It could, perhaps, by a means of helping Spector find reconciliation between his cultural faith and his — for a lack of a better way to put it — cultural faith. After all, he hails from the tribe of wanderers. His current spiritual patron has been proclaimed the god of travelers. Maybe those two faiths are more connected than one would initially expect. 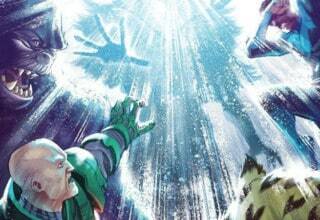 If he could find that reconciliation, could he perhaps break the maladaptive coping skill that led to him first using alternate identities to solve his problems and later fueled his delusional episodes when he struggled to be able to know who the “real” him was — Spector, Lockley, Grant, Moon Knight or someone else entirely? When the Fist of Khonshu returns to the United States, he has finally fully given himself over to a fractured life. He develops multiple identities: Steven Grant, the millionaire with a dirty past full of making money by wielding a gun and Jake Lockley, the streetwise cabbie. He also maintains Marc Spector. As a former mercenary, the Spector identity allows him to sit and party with the kind of criminal types who had been successful enough over the years to play nouveau riche. 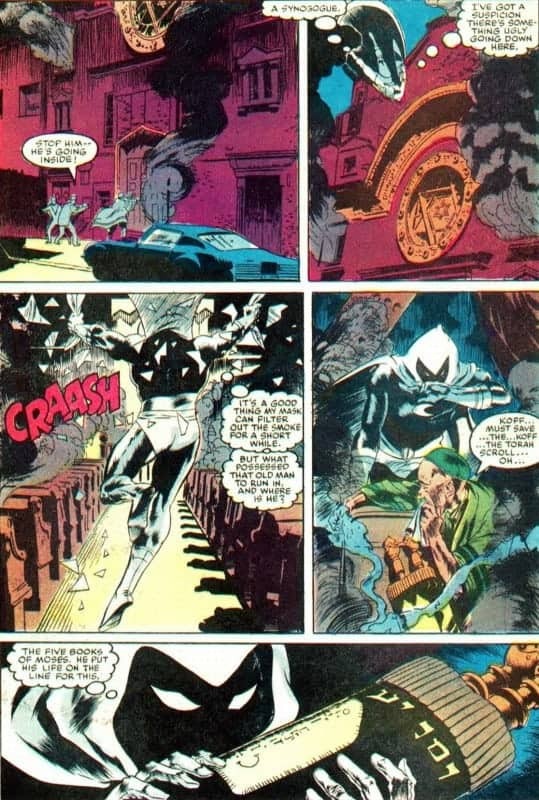 And then, of course, there is Moon Knight, itself effectively another identity. 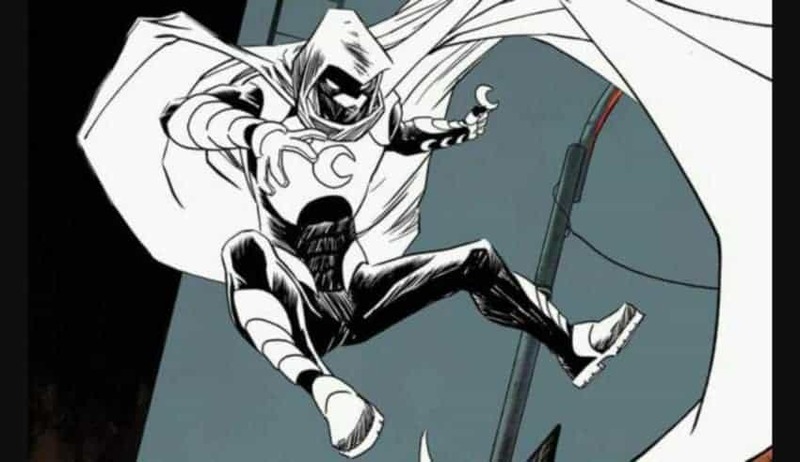 He has split further recently, creating identities within the Moon Knight alter ego. The traditional “monk” — the all-white robes — ended up joined by the sharply dressed man, and the black and white armored avenger. 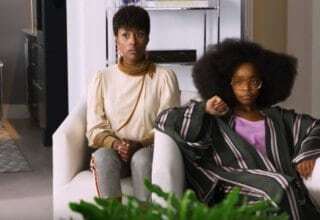 However, it all began back in Chicago in a modest home with a boy not ready to be honest about his lack of faith but unable to convince himself to be faithful. Previous article RED DEAD REDEMPTION – What’s Next For The Series? This was a surprisingly good read. 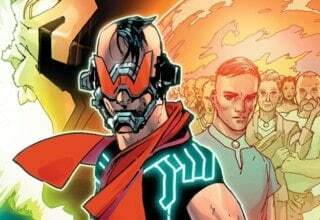 I hadn’t made some of the connections, but as a long-time MK fan and someone who is incredibly interested in religious sects/themes/imagery in comics there was quite a good bit here that got me thinking. Thanks for the post!